Two blogs ago (below, with the photo of the straw house) I mentioned the phenomenon of peak oil and what the future might look like: the past, perhaps! We took our friends, Luke and Erica and their kids to the fête du blé at Pleudihen this weekend where we saw demonstrations of how harvesting was done in less mechanised times. 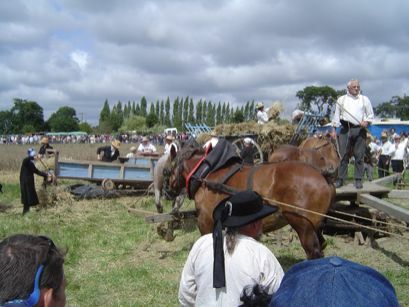 For sure, it was at a fête and it did look like hard work but everyone seemed to be having a laugh working together and many people were taking a real pride in what they were doing and showing off their knowledge. 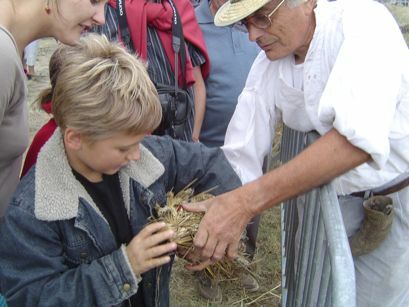 Photos are of a group working around a horse-powered “combine harvester” and of Max being shown how to make a tie out of straw to bind the cut sheaves together. It’s a while since I read it but I found The Corrosion of Character: Personal Consequences of Work in the New Capitalism by Richard Sennett very illustrative and thought-provoking if a little depressing as he describes how some of the pride and pleasure of working has disappeared from the modern workplace. Compare the traditional baker, adjusting proportions of ingredients according to, say, changes in the weather or different flour available, to turn out consistently good bread. A more modern bakery might be highly mechanised and thus the baker is demoted to the role of machine watcher, reliant on the repair mechanic if things go wrong. The modern day farmer suffers a much higher suicide rate than average (see also). I wonder how this compares to the farming industry in years gone by, with large groups of people working together as in the photo above? Erica has suggested we read News From Nowhere by William Morris, “is the tale of William Guest, a Victorian who wakes one morning to find himself in the year 2102 and discovers a society that has changed beyond recognition into a pastoral paradise, in which all people live in blissful equality and contentment". Please post a comment if you have read either of these books and what you think of them or have other book suggestions!